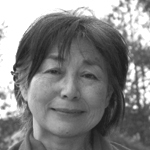 Lily Yeh is an internationally celebrated artist whose work has taken her to communities throughout the world as Founder and Executive Director of the Village of Arts and Humanities in North Philadelphia from 1968 to 2004. She helped create a national model of community building through the arts. 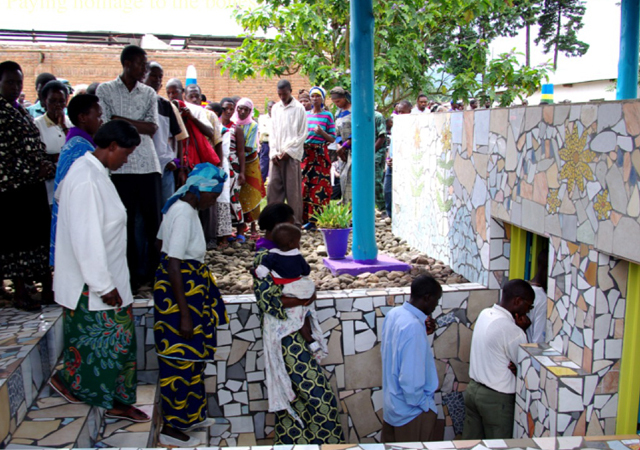 In 2002, Yeh founded Barefoot Artists Incorporated to bring the transformative power of arts to impoverished communities around the globe through participatory multifaceted projects that foster community wealth, improve the physical environment, promote economic development and preserve indigenous art and culture. In addition to the United States, she’s carried on her projects in multiple countries -- Kenya, Haiti, Philadelphia, Ivory Coast, Ghana, Rwanda, China, Taiwan, Ecuador, Syria, Republic of Georgia, Haiti and just returning now from Palestine. Welcome, Lily. Yes. I think the participatory creative process everywhere, in community or in schools, is very, very empowering for young people, for people in disenfranchised communities. They don’t have the voice. They can’t express themselves. And so often they feel that they have no power. But in the art, it’s a direct participation. And if we encourage everybody to imagine and to express their voices and not be afraid, that is a very effective way to empower people. So Venus truly is an agent of a trickster redeemer within us all. If we animate our own creativity, we have more freedom. Just as this young woman expressed. I want to tell you the story. Dandelion School, it’s far out on the outskirts of Beijing. And I thought, “Okay, you have some influence there.” But a group of young women from Darien, Connecticut, from a very prosperous wealthy community, they visitesd China. They spent one day in Dandelion School and they were so impressed by the environment, by the creativity of the people. They didn’t know that academic environments don’t have to be just whiteboards and books. And so they came back empowered. They formed an art club and they demand to have their voices heard through painting. So they created the mural to color. And this is in Darien High School. 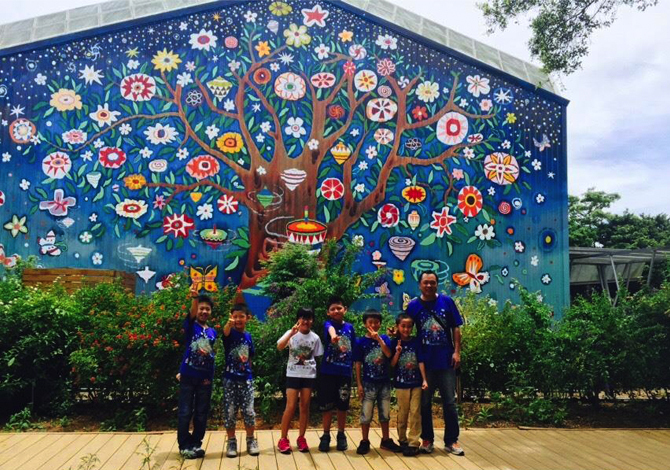 Three-story Mei Hua Gyro Tree of Life mural, completed in March of 2015. Mei Hua (Beautiful Flower) Elementary School is located in a remote, rural area in Daxi, Taiwan. Most its students are from poor, indigenous, skip-generation and new immigrant families. In response to dwindling energy at the school, and a three-year drop in student population from 108 students to 43, the school invited Lily Yeh to lead a revitalization project through art. My late great friend Zen master Wu Bong when we’d drive around would go, “Looks like a prison. Must be a school.” And so you’re transforming these schools, these hardship places. I want to also speak to beauty and danger. There’s a wonderful lecture that Peter Warshall, late great environmental ally, was doing on nature and how beauty and danger are intertwined in the evolution of this planet in some serious way. He says octopi in the sea create magnetize biofluorescence which is very beautiful and other little creatures go, “How beautiful!” And then they eat them. We know everywhere in our own personal and collective lives old structures are collapsing and we can either go waily-waily or we can view it as an opportunity for liberating ingenuity to redesign the world. So well described. I would like to reverse the order and say danger and beauty. It reminds me one of the most powerful moments that I experienced when I walked into the dumpsite community in this place called Korogocho. It’s twenty minutes outside of Nairobi. And the community of 100,000 people wanted to build the shanty around a big dumpsite with a dead lake in the middle. Nobody in their right mind would walk into such a place full of poisonous air and the pollution and the violence of poverty. And yet, when there is nothing else one can do and one starts to bring color, bring creativity and invite children, adults come together to imagine what their world can be. And when we put the bright colors on the wall, nobody thought beauty can exist in such a dire place including me at the beginning. 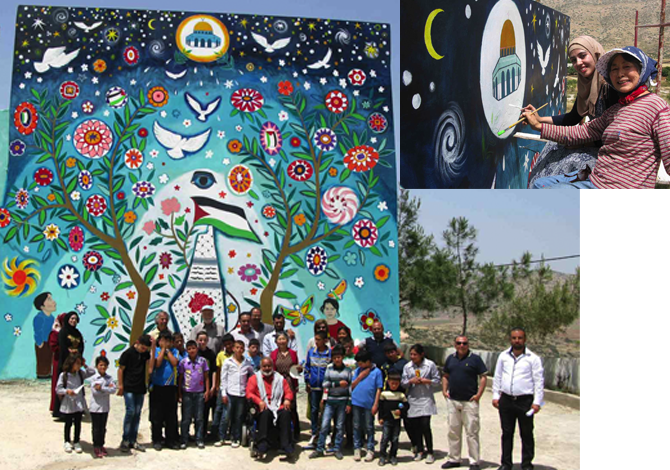 But when we put beautiful colors on the wall, when we put flowers, when we put angels, when we put all the big birds and all the things they imagine, and that begins to transform the mentality and create a sense of hope for the community. And that was one of the most powerful moments I have ever experienced. And I always say that when it seems like one can do nothing in such desperation, if we create through imagination, creativity, and make beauty, it is like making a fire in the dead winter night. And that strikes hope. Brings light. And that beckons people to join us. And that’s the power potential of broken places, places of despair, ready for transformation. I know that you went also into Rwanda when there was still fighting. I didn’t have any idea what I would do. I just want to be there and to be where the pain is, the brokenness and listen. And then what followed was the ten-year project unfolding and leading through the building of the genocide memorial and then working with villagers and then transforming from destitution and despair of a genocide survivor village of 100 families into the beginning of prosperity with jobs and with assets and a cottage business and so forth. So that transformed not only the villagers but also transformed me. Yes, all of us have the power to help and to transform each other. Yes. And as we dedicate in this call and forevermore in our hearts, when we internally dedicate it strengthens our signal so we’re more likely to connect with these opportunities. We say inward dedication magnetizes outward opportunity. Shamanic ally Martin Prechtel says when he came back to America after 25 years in Guatemala, he’d forgotten that Americans had lost the art of grief. He said for lack of grief, we go to war. How do we metabolize and honor grief again through beauty, which is so much of the medicine that you carry and inspire in us. It comes from the same place. From the same place. When you talk about grief and beauty, the beauty that moves comes from the broken dark places. And it roots in the depth of humanity. That has light, has darkness, has good, and also has bad intention, evil intentions. And that’s when we always have to keep vigilant. And that’s the metaphor of Buddhist symbol, the lotus flower. It roots in the darkness of muddy water, in mud, in chaos. But it strives towards the light. And when the flower opens in its perfect symmetry, in beauty, that represents enlightenment. Rooted knowing the grief and the pain and the darkness but then keeping to the light. And that’s when the beauty is wrestled from the heart of darkness. That has the power to transform. That’s so great. May all our metaphors be derived from nature like the lotus…. Remember in the United States after 9/11, there were spontaneous altars and beauty of poignancy everywhere. And then that beautiful impulse was kidnapped into the unimaginative tyranny of war. So we want to put it back in everyone’s core response that their primary and sustaining response to tragedy is dynamic beauty and honoring the art of grief. Her name means “never not broken.” And that’s how I’ve introduced you before ---because you have introduced yourself saying that when you started off on this, at first you were frightened. Oh, yes. Well, not only the first time. I mean, who is prepared to walk into darkness? There is unknown. You don’t know what’s lurking there. One doesn’t know whether one has the capacity to deal with the unknown. That unknown is very scary. And then every time -- for example, in Rwanda, I could never imagine that I would go to a place that’s not even on my agenda? 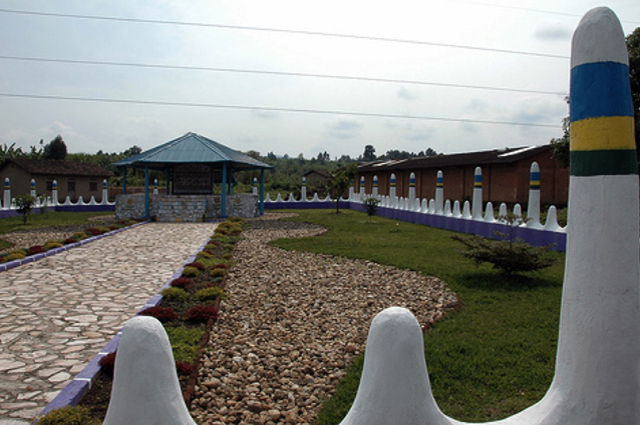 And then I would build a genocide memorial. That is totally frightening. Even when I think about it now, I get scared because when you do that, you touch people’s bones. And the bone represents the most grieved part of the national psyche. And if I do anything wrong, then I really become -- I don’t know how to reconcile to that deep grief. Yet when we are guided by our heart, when life beckons us, and when we are sensitive to the inner voice, and when we are brave enough to follow life’s calling, then wonders happen. Things unfold. And then you have guardian angels. When you’re lost, there are birds talking to you. There are animals pointing directions. There are people along the way helping us. We just have to be brave enough to listen to our heart, which has that wisdom, intuition, that evolved through millions of years. Nature’s evolution. A lot of time we don’t pay attention. We lose touch with that. And so it is through not only learned skills, knowledge and everything, but also listening to the heartbeat of our inner voices. That comes from light, from the depths of being itself. And that takes us to the heart of everything. When I first heard you at the Bioneers Conference, you said you were daunted. And then you said there was a deep voice inside you that said, “But if you don’t do this thing, the most important part of you will die.” So you said you made yourself frightened of being a coward. Yes. Well, fear, in a way, is our friend. Like life causes us to move forward. And if we’re always in our comfort zone, we will be like in a cocoon. But when we break the comfort zone, we always get scared. But then in the transformation from cocoon to butterfly… a world of wonder and revelation. It’s important we not only heal others. We must heal the wound inside. Otherwise, it festers. And then it expresses that hurt and wound and pain through the things we touch and things we do. And so a person who journeys, a spiritual journey, a life journey is both internal and external simultaneously. That demands our attention. And that creates a partnership. Jojo, he was so angry. He was always screaming, yelling and wearing bandana like a pirate and then with knives and hammers walking down, raging down the street. Everybody is afraid of him. But I didn’t know that history. But I knew he was a jack of all trades. So I went to him and he dodged me three times. And the last time I talked to him, I tracked him down. And then I said, “Jojo, let’s build this park.” And he was moved by that idea of beauty, green and flowers and art and whatever. He decided to help me. And I said to him, “I need your help.” So….he become a giant person. He’s going to help me, this person, someday outside to do this art park. So just by that invitation and that respect of his ability, then we’re equalizing the ground. And that’s how you do community work, equal footing and equal exchange. In open, inclusive with respect. And that’s the first rule for success in community building work. And that’s another reason I so love and admire your dedication because it is so clean. We want to beware and compost any sneaky little tendril of colonialism that may adhere to us and even our goodhearted spirituality whenever we feel special or more important than … You’re guiding people to their own autonomy. And I just want to say that that’s a crucial working principle for all women heroes and that which resides within men as well, which is, does any teaching or project, does it guide people to their own autonomy? Or does it pull them into an external dependence. So these projects continue even when you’re not there, right? Right. In successful project I will go there and start working with people to create a process that is inclusive and participatory and democratic and full of fun. But the most important thing is that attitude. We are not special. Everyone has that divine. The Kingdom of God is laying inside of us. And so we go there and I got in touch with the light, the flicker of light. And that’s been guiding me. And so, when I go to a project, I don’t want to dominate. It’s not about me. It’s about us together. And it’s about that real joy and that joy will come out when we treat each other with respect, with sincerity, no hidden agenda. And that nurtures deeply inside. That’s why we do it. Because it feels good. It feels honest. And it feels authentic. And then through the work, we light up everybody’s, try to light up other people’s private life. And to expel the darkness, the ignorance in that kind of egohood and attachment. We need more light, more people lit up across the continent, across the land. And, yes, we do hope and we can do it. Yes. We don’t have to create cultural movements. These movements are happening. They want to happen with us as their agents. And again, may we be dedicated. Is there a blessing you’d like to spiral out to each kind heart here gathered and spiraling out there into the memosphere? I think my wish is that it is so simple, that we all can do it especially the women, softer, gentler, usually because of the feminine, more yielding. And, I think, my wish is that we don’t need to create any great movement or great event or whatever. If we can, just be more of our authentic self. Be honest, be true. And celebrate who we are. And we listen to the voices inside and work very hard, learn all the skill. We all can light up a fire and change the surroundings around us. And we become transformed in the process. Thank you so much. Thank you so much. May we cahoot in perpetuity and may all of our hearts bloom under the beautiful gentle rain of your dedicated wisdom. Caroline W. Casey - is dedicated to Pragmatic Mysticism-Democratic Animism and the Trickster Medicine that brews it all together- to encourage a Renaissance of Reverent Ingenuity (rising from the rubble of humorless dominance). She is host-creator, weaver of context for “The Visionary Activist Show” on Pacifica Radio Network, from D.C to KPFA (94.1); her guests are leading contributors to a culture of reverent ingenuity, all teased into pertinence. Her audio book Visionary Activist Astrology is published by Sounds True. She is the author of Making the Gods Work For You — the astrological language of the psyche (Harmony Books/Random House). 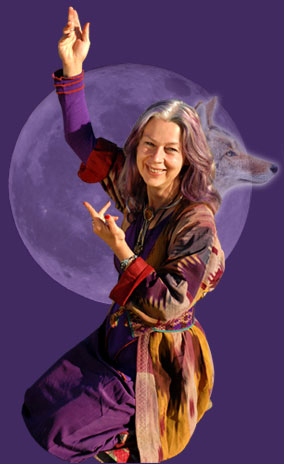 A rousing and frequent key note speaker and MC (Symbiosis and Gaia Festivals), she offers Trickster Training Council a weekly tele-class as well as councils at a wide variety of conferences all over America as well as in South Africa, Bali, Sweden, Syria, UK, New Zealand, Hawaii, the Caribbean, British Columbia. Caroline invites us to imagine, conjure, and implement a more lovingly ingenious world.